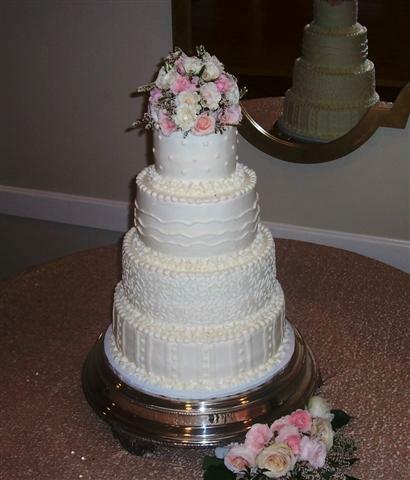 It’s fun to create a wedding cake with different designs. I made a drawing for the bride with lots of ideas and she liked these designs best. On the top I have dots, then a horizontal wavy line, a Cornelia lace design, and at the bottom stripes & dots. Flavors are a classic yellow butter cake iced in Vanilla butter cream. Fresh roses are added for the topper.